& 3G mobile transmission technology and IR image monitoring and thermo detection such kinds of security technologies. - IR thermo image monitoring and detection for moving objects, the double detection technology can eliminate the false alarm caused by environmental reasons. - It has real-time mobile AV alarm and e-mail video image back-up receiving model. - You can monitor the site by mobile phone at any time. - You can use mobile to monitor the voice at the remote site. - Easy operate with a wireless remote control device by simple mobile instructions. - You can setting if the siren and beacon device to be activated when alarm happen. - Under emergency situation EMSD key can silently inform any designated users. 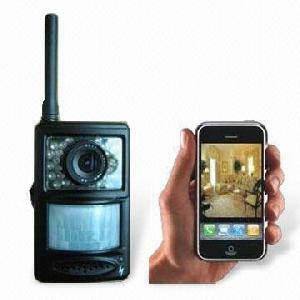 - Able to add external siren to enhance the sound to frighten the burglar. - With build-in back up battery, device can be still operating during power failure. - Able to add external 4 wired detectors and 9 wireless detectors. - Add door bell function, very convenient and practical. - With IR night vision camera, it provides full time 24 hours day and night monitoring function.